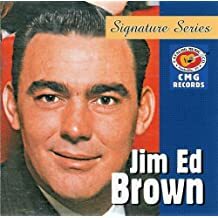 Jim Ed Brown was born April 1, 1934 in the state of Arkansas. He gained fame in the 1950's with his two sisters as a member of The Browns. The song "Looking Back to See" earned them national recognition while performing on the Ernest Tubb radio show. It hit the top ten and stayed on the charts through the summer of 1954. The Browns had many hits that we still so enjoy today. The group disbanded in the mid 60's and Jim Ed had a very successful solo career from 1965 to 1974. At that time he joined with Helen Cornelius and they performed though 1981 giving us great songs, many of which were big hits. Jim Ed was a very active member of the Grand Ole Opera and has a very popular radio show. We are ever appreciative of the wonderful music he has given us to enjoy, what a great voice.